‘Tis the season…to cook with pumpkin! And it seems like I keep seeing a partial can of pumpkin purée in my fridge, leftover from the last pumpkin recipe I’ve made. 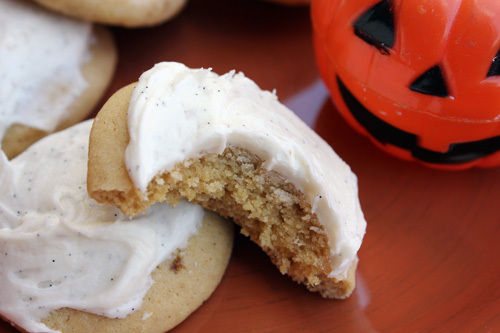 So here it goes: the perfect solution: “Soft Pumpkin Cookies with Vanilla Bean Buttercream,” from Healthy Delicious. The little bit of pumpkin purée in this batter will tint your cookies, just a little, which is cute. I like to hand-roll and flatten cookie balls -- I’ll say it’s my favorite way to make cookies. These cook into soft, pleasant treats, where butter is the star of the show. But the killer, here? The frosting. Wow. Butter + vanilla + powdered sugar + coconut milk. Scraping a vanilla bean is so satisfying. This frosting makes me hopeful for the future, for the possibilities ahead of us. Enjoy and celebrate. Next time, I hope to please my dinner trio with the “Polenta Cakes with Portobello Mushrooms and Burrata,” from Savory Nothings. Come back to my site next week to see what happens.